Common sense is the boat operator’s best defense against oops moments. The oft-used adage “common sense isn’t very common” rings especially true on the water these days. Boat operators are making mistakes that can be easily avoided with just a little thought and care. With that in mind, we wanted to compile a list of actions that can lead to detrimental results, followed by suggestions to help drivers avoid an oops moment or two. Every one of the “suggestions” contained here really amounts to nothing more than sound reasoning — common sense. Think before you act and you’ll quickly see the wisdom in paying attention. Whether on a dare or out of sheer ignorance, exceeding one’s skill limits can prove disastrous. Witness four NFL players fishing 40 miles out in the Gulf of Mexico in bad weather; three of the four died. Recently, a major-league pitching phenom was speeding back into port at night without any night-navigation skills or experience; he and his passengers died when he ran the boat up onto the outer jetty. I tested a boat with the builder’s chief engineer at the helm who forgot that he had turned the wheel hard-over when we stopped. When he throttled up again, the boat tipped up on its beam end, green water came over the gunwale and the boat swamped. Most boats today don’t have such a problem, but why take a chance. Always check that your helm is centered prior to giving it the gas. If your boat suffers from dramatic bowrise when you advance the throttle, never start up without adding tabs and/or making sure the outboard or outdrives are in the full-down position. After getting on plane, ease off on the tabs and raise the drives to cruise configuration. Don’t get outrageous in your maneuvers. Someone will get hurt. In fact, you should warn all your passengers prior to any “dramatic” maneuver. See “Crazy Driver.” The same admonishment applies. Just because a boat can exceed 60 mph doesn’t mean it should always go fast. A boat’s speed should be such that the ride is smooth enough to not throw any passengers around. Remember, the ride is never as rough for the helmsman as it is for the passengers! Be considerate of everyone on the boat — and of the boat itself. Once when I was young, I played chicken with another boat. We headed obliquely toward each other at cruising speed. At the last moment we both turned away. Unfortunately, the other boat was old and in disrepair. The entire steering helm of his 13-foot skiff came off in his hands and his boat ran right up and over the bow of my skiff. Yes, I dodged a bullet by a hairsbreadth — and learned a lesson that has stuck with me for life. Yes, trimming the boat’s bow down in a chop makes the ride smoother, to a point. But over-trimming can cause something called bow-steer, where the boat suddenly and unexpectedly swerves in one direction or another. That’s scary and dangerous. Another youthful tale: Friends and I went wake-jumping. The helmsman in our boat chickened out at the last moment and cut the throttle. But just as our bow lifted over the wake, he shoved it forward again. We went straight up into the air and landed on our transom, swamping our boat. Luckily, we were in the first vessel designed to be unsinkable. But matters got very messy with both the cleanup and with our parents. Even if you just launch and land safely, it is so easy to get injured when a boat flies through the air rather than running through the water. 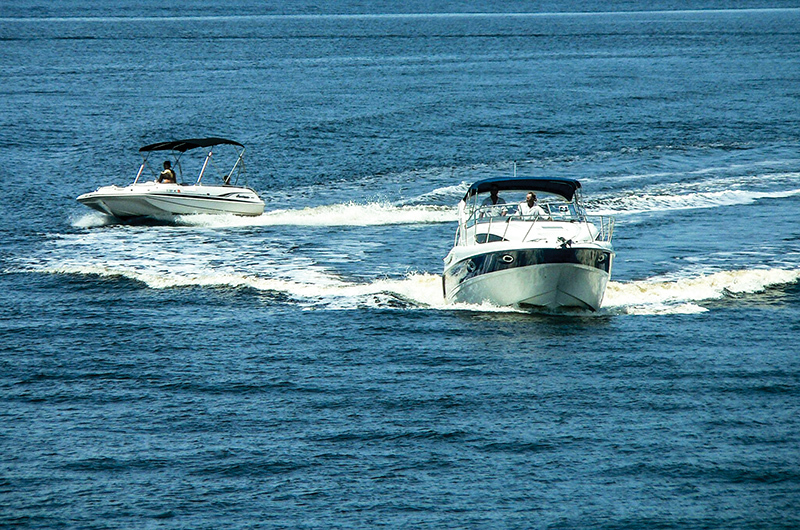 I suggest you watch a video about a boat running along happily until the driver crosses a wake improperly (tinyurl.com/kg543ge). People got injured. Always use prudence and learn how to cross a wake safely. I’ve lost two friends in separate accidents involving boats passing under bridges at cruising speed or faster. You just never know when someone might pop out from behind a bridge abutment into your path, and boats don’t have brakes. No matter what the local laws say, use prudence and slow to idle speed when going under a bridge. Having a chart or an electronic chartplotter is not the same as having local knowledge of an area. Smart boat operators stay in the marked channel and don’t take unnecessary chances that insurance companies are sure to frown upon. Don’t depend on official or unofficial charts to be accurate. Queen Elizabeth II ran aground on a rock in Massachusetts because the sounding data hadn’t been updated since 1812! Surveying America’s navigable waters is not a budget priority. If it isn’t a major commercial shipping port, chances are it won’t see a survey crew anytime soon. Take it slow and watch the depthsounder. And be sure to calibrate your sounder specifically for your boat, to get the most accurate readings possible. Besides being illegal in most, if not all, states, letting passengers ride with their legs hanging outside the rail on the bow is extremely dangerous. Hitting a wave, bouncing a passenger up off the rail and over the side where, a nano-second later, he meets with a spinning propeller will surely generate disastrous results. Use common sense and don’t do it. Combine knowledge of the Rules of the Road with always having someone responsible for situational awareness, and you can have a safe trip. Remember, that boat crossing your path may not have the right of way, but if he hits you and someone gets injured or dies, right of way will be small consolation. Sure, the fishing bite might be red hot, but those big, dark clouds and lightning on the horizon seem headed your way. Believe me when I say that you often can’t outrun a storm. And lightning, which scares me more than wind and rain, often strikes 20 to 30 miles from the visible storm. Head home early. Lay all your fishing rods down flat or store them in lockers. Extend your outriggers as close as possible to parallel to the water to decrease electrical potential. Now go home! Anchoring seems like an easy exercise, right? Drop the anchor over the side and wait till it grabs. But if you have anchor line coiled on deck, make sure nobody’s feet or hands are in one of the coils, because when the line comes taut, it acts like pruning shears. • Don’t anchor near other vessels without considering what will happen when the tide or wind changes and swings the boat around in another direction. Who might it hit? • Don’t drop an anchor on top of someone else’s. • Back down gently on your anchor to make sure it sets properly. Never just assume that it will. • Never drop your anchor on patch coral. Seek out the bare, sandy spot nearby. • When maneuvering during deployment or retrieving your anchor, be very careful to not run over your own anchor line. It will foul the prop, perhaps causing the boat to drift uncontrollably. It’s always best to have a person on the bow pointing in the direction of the anchor and keeping you from overrunning your rode when retrieving the hook. • Don’t ever throw your anchor overboard without ascertaining that the bitter end of the anchor line is tied to your boat! Losing your anchor in this fashion is both expensive and appallingly embarrassing. I watched a YouTube video recently where single-screw fishing boats competed for the fastest “back-into-a-slip” docking time. If I ever tried that as a kid, my father or grandfather would have killed me. I’d have been old before I ever ran one of our boats again. Try never to use your throttle(s) when docking. Each time you do, the amount of counter-thrust needed to balance the maneuver seems to increase. Remember, reverse is the only set of “brakes” you have. Don’t approach any close-quarters maneuver without first determining what the wind and current are doing and how they might affect your boat. Don’t ever try to stop a large boat from hitting a dock or another boat with your hands, feet or any other body part. That’s what fenders are for. Don’t assume the dock worker is putting the filler hose into the correct pipe. You may end up with water in your fuel, which is almost (but not quite) as bad as your wife taking a shower in diesel or gasoline. Don’t simply assume that everyone else knows how to anchor properly. Always assume they don’t and take care of your own boat. Drop your anchor where it won’t foul on someone else’s. Make sure you have your own fenders set and a helper with a mobile fender. Prepare your bow, stern and spring lines in advance. Don’t ever start your engine and maneuver without counting your passengers and having a dedicated watchstander at the transom. 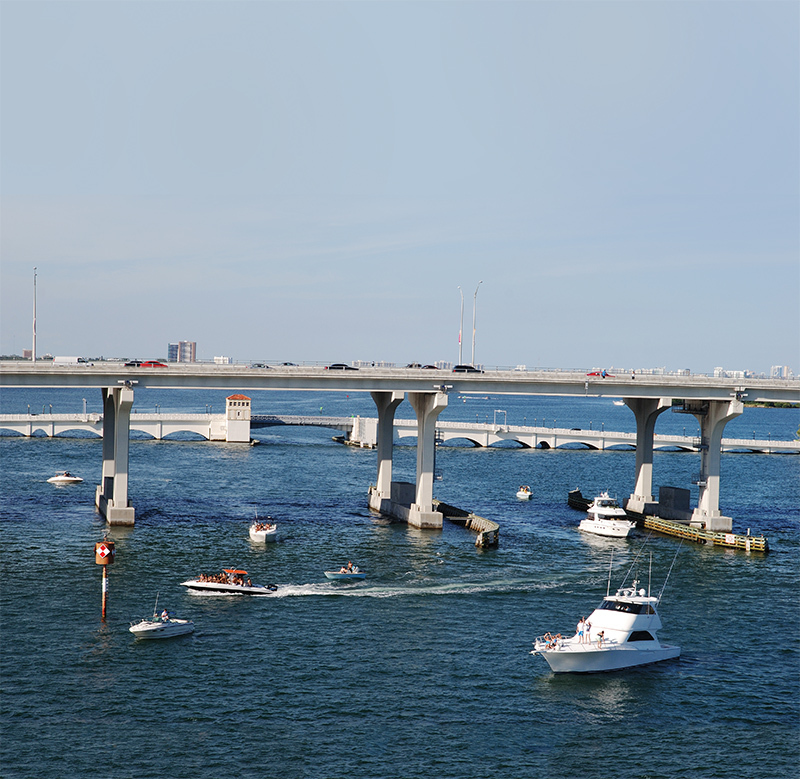 Many boaters believe they have the right of way in a crossing situation with a ship. While it may be true if both boats are offshore, it probably isn’t true in a channel, since the big ship is less maneuverable than a smaller vessel. Either way, remember that a helmsman standing on the bridge of a ship cannot see closer than several hundred yards ahead due to the height of the bow. A boat that disappears into this blind zone could easily get run down — and chances are very good the ship won’t even feel a bump. So even if you do have the right of way, you may end up being dead right. Use common sense. While various types of line might work to tow skiers and water toys, don’t use any line other than polypropylene. It’s the only material that floats, helping to keep it out of the prop. 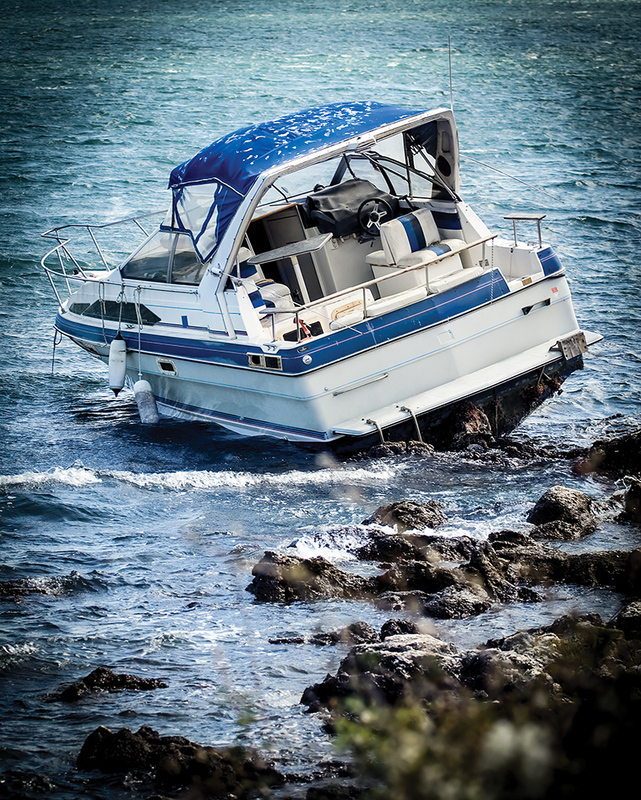 If you are towing another vessel, don’t let anyone stand near or in-line with the tow rope. If it breaks under high tension, it could remove a body part someone might miss. Never let off the throttle completely in a turn when driving a boat equipped with water-jet propulsion. Doing so immediately cancels your turn and sends your vessel in a straight line — often directly into the obstruction you were turning to avoid.